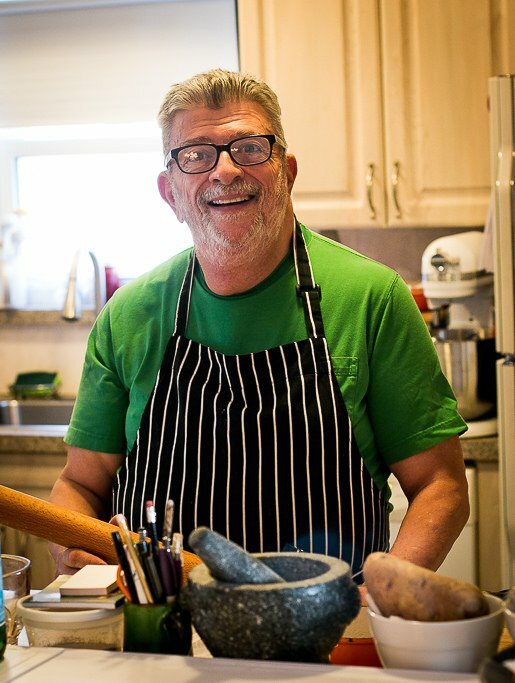 If you like to bake and have picked up one of his books, you’ll probably feel a little kinship with him as well. 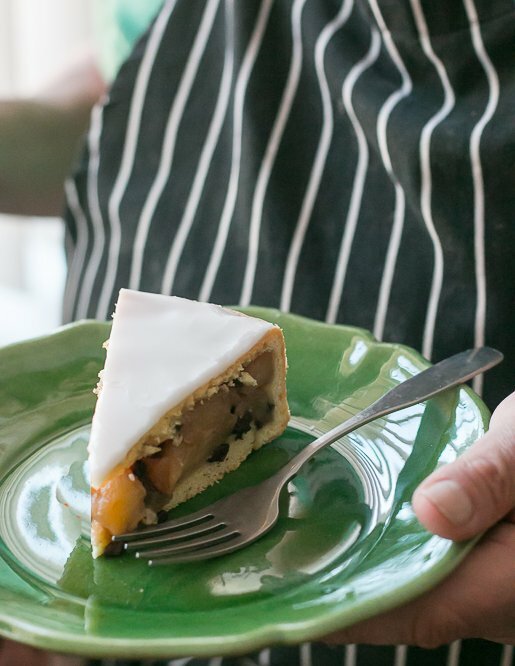 Nick established his credentials as a baking professor and author after stints as the Executive Pastry Chef at the Windows on the World restaurant, as well as having extensive experience baking professionally in Switzerland, Monaco, and France. But not to worry. Nick’s focus now is on home baking, and his newest book is meant to make home baking as straightforward and foolproof as possible. 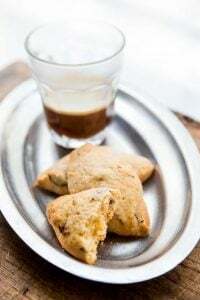 Nick Malgieri’s Pastry: Foolproof Recipes for the Home Cook has spectacular photos by Romulo Yanes, who many know for his brilliant photography that appeared for years on the cover, and inside, of the much-missed Gourmet magazine. For those that like books with lots of pictures, and step-by-step photos, this is the book for you, especially if you want to tackle some of those more challenging doughs, like Viennese strudel and yeast dough, as well as French brioche and yufka, the Turkish version of filo dough. They’re all demystified here. 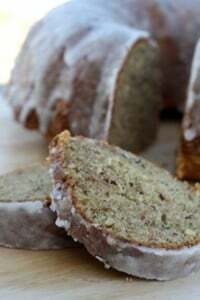 (For gluten-free bakers, he presents two different recipes without a laundry list of difficult ingredients.) 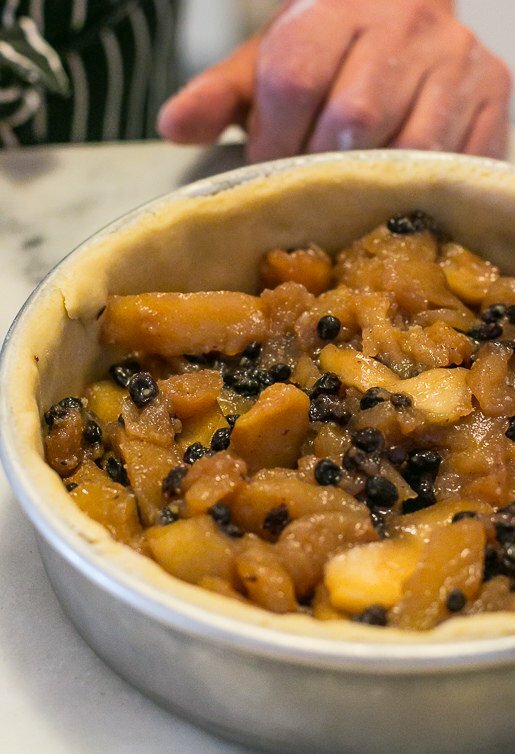 There’s also pizza chiena, baked in a cake pan, as well as this lovely French Apple Pie, a neat puck of pastry filled with cooked apples and raisins. I have a pretty good memory and do remember when I was a kid, seeing lots of desserts topped with white icing, the kind that hardened and crackled on your teeth when you bit into it. 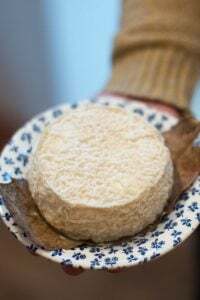 I liked to reach into the cardboard bakery boxes that my parents brought home from a local bakery on Sunday morning, picking crunchy icing shards off the flaky coffee cakes, which were loaded with toasted almonds and soft raisins dotted all around. Ah, bliss… So when I saw this pie in his book, the smooth glaze immediately appealed to me. Speaking of pie, the French also don’t really have a word for pie. 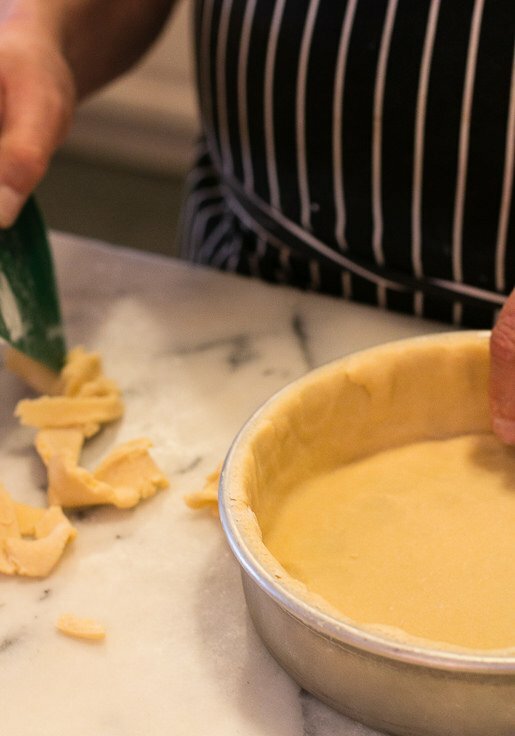 An enclosed tarte is usually how I describe it to French friends, but an American pie is usually a slightly less-formal affair with a crimped crust, and baked in a shallow dish with sloping sides. And it’s a mess when you serve it, which is considered a good thing. (I’d rather have a juicy wedge of pie than one with fruit firmed up with too much thickener.) For the sake of nostalgia, Nick is right to call this a pie, and I’m going to call it as “French,” since it’s refined enough so that you might see something like it in a fancy pastry shop in Paris. Nick’s still a hero of mine, especially because he invited me over the other day, to share this pie with you. It’s easy to make and is, indeed, foolproof. 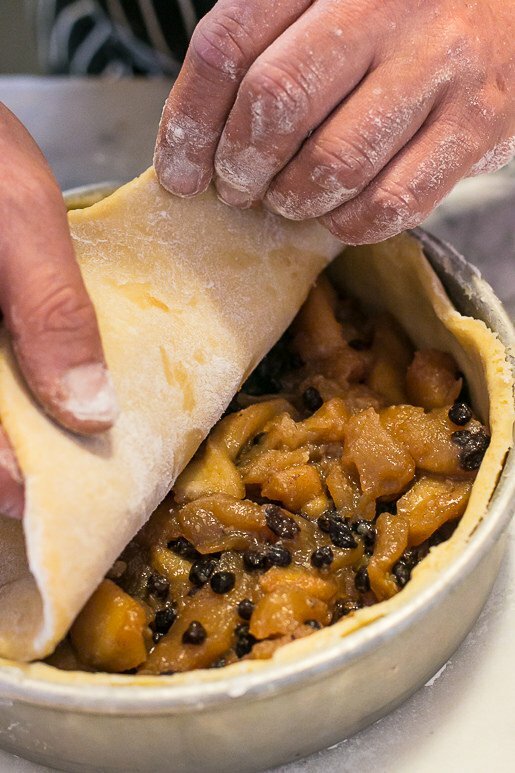 It’s just two sheets of dough fitted into a cake pan, filled with a meltingly tender mound of sautéed apples along with raisins or currants, then covered and baked. Once cooled, a slick of icing is spread over the top and left to firm up before diving in. The icing adds a sophisticated look to the pie and gives it a little je ne sais quoi, which means “I don’t know what,” but in this case, I think I know – the crunchy icing is the “what.” And whatever else it is, or whatever you want to call it, it’s pretty delicious. When we were eating the apple pie at his dining table, even though I keep trying to become French (and getting thwarted at every turn..) I guess I’ll always be très américain, and couldn’t help tinkering with tradition and thought that the glaze would be nice with a shot of calvados in it. So if you want to replace a small amount of the water, perhaps up to half of it, with liqueur (such as calvados, Cognac, or Armagnac), I think it’d give the cake a little nod in another direction, if you’re so inclined. After getting to hang out with him in his amazing kitchen (although few in New York have room in their apartments for a rolling pin as tall as his! ), he packed up a few pieces of French apple pie for me to take-away, a nice souvenir of a visit to Nick in his kitchen, which I enjoyed the next day for breakfast. Yes, it travels well, from France (maybe…) via the oven of a New York baker, landing right at home, on my table. 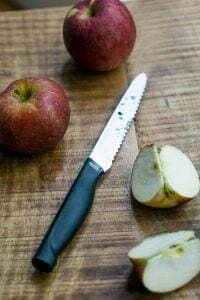 Reprinted with permission from Nick Malgieri’s Pastry: Foolproof Recipes for the Home Cook, by Nick MalgieriNick uses Golden Delicious apples, which aren’t overly juicy when cooked and reliably hold their shape well. However if you have a favorite baking apple, you could use that. 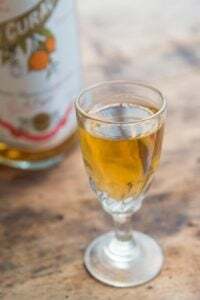 If you don’t wish to add the rum, use 1 teaspoon of vanilla extract in its place. 1. For the apple filling, peel, halve, core, and cut the apples into thin wedges. Melt the butter in a wide saucepan or Dutch oven with a cover, and add all the remaining ingredients but the rum. Stir well and place on medium heat. Cook until the apples start to sizzle, then cover the pan and decrease the heat. Cook until the apples have exuded water, between 5 and 10 minutes. Uncover the pan and stir occasionally while the water evaporates. Remove from heat, add the rum, and spread the filling in a shallow bowl. Refrigerate the apple filling. 2. For the dough, combine the flour, sugar, baking powder, and salt in the bowl of a food processor and pulse to mix. (You can also make this by hand, in a bowl.) Cut the butter into 8 or 10 pieces and add. Pulse until the butter is no longer in visible pieces. Add the eggs and pulse until the dough starts to form a ball. Invert to a floured work surface and carefully remove the blade. 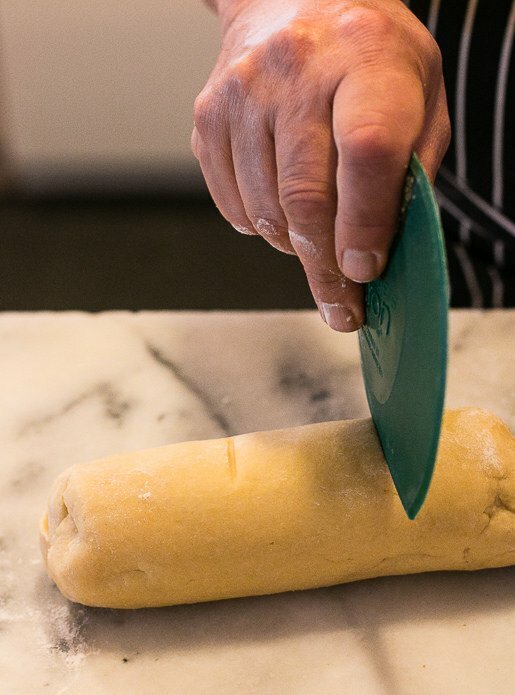 Wrap and chill the dough. 3. When you are ready to assemble the pie, set a rack in the lowest level of the oven and preheat to 350ºF (180ºC) degrees. 4. Lightly knead the chilled dough to soften it. 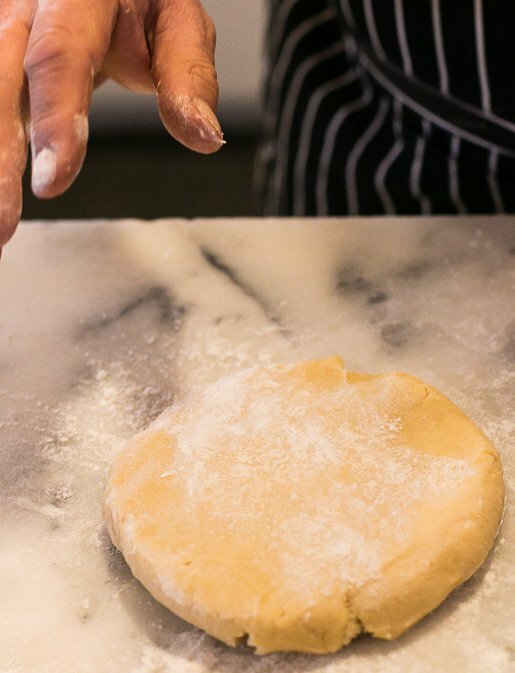 Roll a little more than half the dough on a floured surface and line the pan. Cut away excess dough at the rim of the pan. Spread the chilled apple filling in the crust. 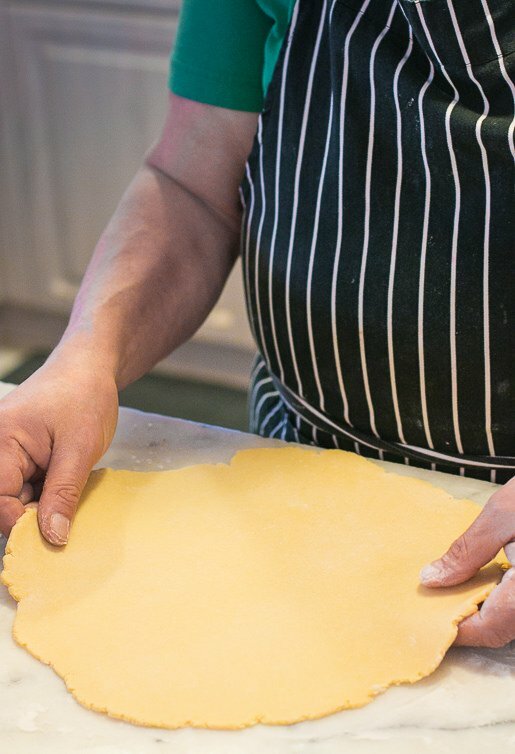 Roll the remaining dough and cut an 8-inch (20cm) disk. Set it atop the filling and fold the dough on the side of the pan over it to seal. 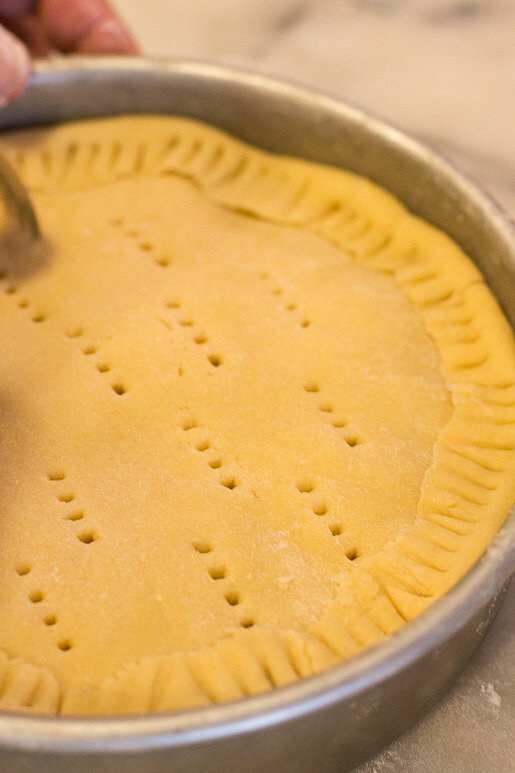 Use a fork to press down the folded dough and to pierce some holes throughout. 5. Bake until the dough is baked through and dark golden, about 35 to 40 minutes. Cool on a rack. 6. Unmold the pie to a platter keeping the bottom of the pie as the top. Combine the confectioners’ sugar and water in a small saucepan and stir well. Heat to lukewarm and quickly spread on the pie. Let the icing set before serving. This sounds so simple in flavor, yet so tasty. And I love how jammy the apples look! Beautiful. Isn’t “tourte” the word for pie? David has the grams of butter correct. One tablespoon equals 14 grams. Eight tablespoons is 1/4 pound or as stated 115 grams. That looks lovely. Golden Delicious apples are horrible when you eat them raw – all wooly and nasty – but I can see how they would be nice in a pie. I am absolutely hopeless at making pastry, though…. 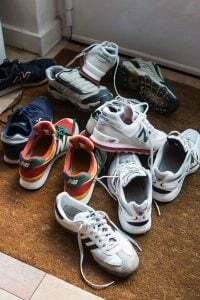 maybe I’ll get my grandson, who is good at it, to do that bit! This looks like the perfect dessert for this coming wekend! I will substitute some Calvados for the water in the glaze. mmm, two dessert to try in one week. Yippee! In true French vs. American fashion this pie is perfectly flat with an even proportion of filling, no little dome in the middle characteristic of over stuffing…(not that I have anything against that). Why do Americans put any thickener in apple pie at all? Just apple, sugar, and maybe some raisins and/or cloves is what my Mum always used. Delicious, and no wallpaper paste texture. That wallpaper paste thing was a real shock when I tried fruit pie in the US. There are a few of Nick Malgieri’s recipes I absolutely love – like his lemon ginger bars, which I make every year – but I no longer buy his recipe books because he does not, and has said he will not, provide weight measurements for his recipes, only American volume measurements. Since there’s never enough time, I prefer to stick with recipes that have a better chance of coming out right the first time I make them, without having to guess how much flour to use. But at least I can try this one – thank you David for testing it for us, it looks beautiful! Delicious & beautiful! The filling looks wonderful. For what it’s worth, I just read a variation of this recipe as a “Irish Apple Cake” in two different places, as I was looking for current-holiday-appropriate things to bake. David, love it that you put the metric measurements for the recipe. I am living in Australia and havent a clue as to what a “Stick of Butter” is. So much appreciated. Actually a ‘table’ of conversions would be a great help. This apple ‘pie” looks wonderful, and similar to a German version my grandmother use to make, but instead of a proper top covering, she would add dollops of the pastry at random. The lemon glaze is perfect. This looks delicious…question, when do you add the rum? 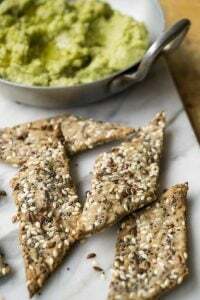 Wondering if there’s a recommended gluten-free flour that this could be made with – cooking a big dinner soon where the guest list includes someone with Celiac disease, and I’d like to avoid ‘poisoning’ my guests if I make this! This post is *just* in time for Super Pi Day! (3.1415). I think you’ve tempted all mathematician-bakers to abandon their chores, forget about the deadlines, and get out their pie pans. After all, we get regular Pi Day every year, but SUPER Pi day is a once in a life-time thing. I love that he used a cake pan. I’m always looking for different ways to present something, especially dessert. As someone who has baked pies for going on 35 years, this was a new concept for me! Also, I ran across a baker (ButterBaking) in Australia who combined a lovely custard/pastry cream with fruit for a Strawberry/Blueberry Custard Pie. Zoinks!!! I’d never thought of putting custard in a fruit pie before. Also, when making my cinnamon rolls I always soak my raisins in Grand Marnier, and of course a lot of nuts (preferably pecans). I wonder if Grand Marnier would be a good adding to the icing. I love your blog by the way! Thanks to the person who mentioned that Golden Delicious are not very good eaten raw. I have always avoided them (they are often recommended in French recipes) as they seem so blah. Will give them a chance in a pie (though my late Mother, the master of traditional American apple pie, preferred Gravensteins or Pippins). 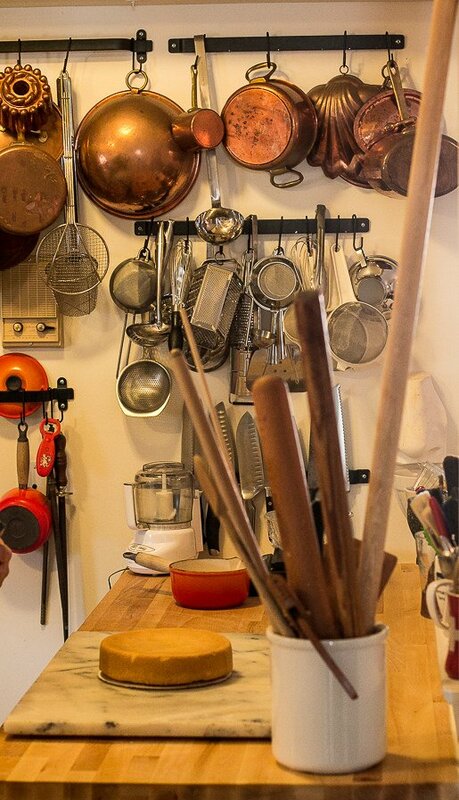 Off topic, what fun to see my lovely copper bowl with brass ring handle hanging on the wall rack in Chef Malgieri’s kitchen! Cela semble être très bon. Good job ! What a pie! what a kitchen! – both heavenly. Something I have been meaning to ask you for ages. Whenever I am in Paris the food markets are full of the most wonderful salads and vegetables and yet when you go to a restaurant, there are no vegetables served with the meals. It is always meat/fish and potatoes/lentils (cooked in a variety of ways). I just wonder is there a reason. I have eaten in lots of places and they never serve those wonderful vegetables. Am I eating in the wrong places? 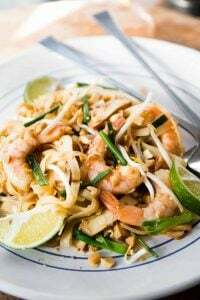 One theory is that vegetable are considered “humble” fare, and when going out to eat, you would want to eat meat and more luxurious offerings. And at home, eat things like salad for dinner and so forth. Another is that preparing vegetables is labor-intensive, and with very high labor costs, it’s more cost-effective for restaurants to serve rice, potatoes, and French fries rather than sides of vegetables, which need to be peeled, trimmed, and cooked with more attention than carbs. Some of the younger chefs are using more vegetables in their cooking, but they are usually presented in more artistic or “presented” ways. 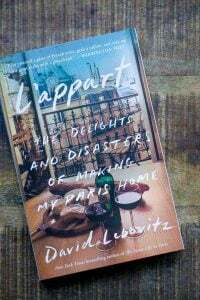 Sounds and looks wonderful; I’ll be ordering his cookbook. Thanks, David. You had me at the word, pie, but when I learned it was a Nick Malgieri creation I knew from the get-go that it would prove spectacular! Pie dough has alway’s been a challenge for me. Either too tough (yes, I know that I overworked it), or simply a patchwork “quilt” creation. Need-less-to-say, Honey-Bunches, you are responsible for a sale. I’m ordering this book today. In the meantime, thank you for offering a recipe. This will be my Sunday bake. Sweets, did you not offer, once-upon-a-time, a story of a brownie recipe, found scripted and flying about the street and it was a Nick creation? I have that item, hard copied and in my recipe file. And YES, it is divine! Hello to Romain. Please remind him that I’m harmless. How wonderful for you to be invited over! This looks so very good, but I think that I would want more filling and less crust. Nick Malgieri (per Alice Medrich) also has a lower fat cookbook, Perfect Light Desserts which is terrific. I attended a class with him in Cincinnati years ago, where he prepared a lighter version pecan pie. I baked it for my church’s monthly bingo games, it was always a hit and sold out immediately. 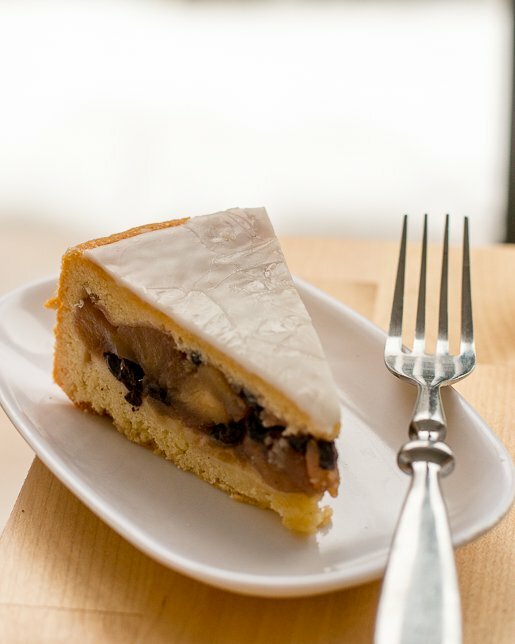 Beautiful…reminds me of coffee cake meets pie meets torte. I want some now! Your blog is the best! One small correction: The Turkish pastry is Yufka, not Yukfa. I took a Chocolate Baking class with Nick at ICE a few years ago and his chocolate cake and chocolate biscotti recipes are still my go-to favorite recipes. Looking forward to making this one…with alcohol. The perfect recepie I was looking for the coming weekend! This pie looks fantastic– and love the idea of embellishing that crackly glaze! Thank you for the recipe! I’ve enjoyed Nick’s wonderful contributions over the years. I’ve been a home hobby cook for years but have always suffered from dysfunctional pie crust syndrome. I’d tense up, over flour, rip the crust and get plain grumpy. Fortunately for fellow DPCS I’ve found a positive step forward; the rolling slipcover cited in Dorie Greenspan’s Baking cookbook. Basically they’re clear plastic circles held together with a zipper. Throw a little flour a ball of dough and roll out to perfect diameter. They’re easy to chill and unzip into your pie plate directly. I bought in two sizes from Amazon and they’re really inexpensive. They’re my training wheels for pie crusts! Just wow! Thank you for the inspiration. every time we find you in our mailbox. How beautiful! I have yet to read any of his books, but from your brief story and adorable pictures, Nick sounds like a friend already. His recipe sounds divine! I took my first baking class, Viennese pastry, with Nick in 1980 in NYC. a great teach & great guy. I think we’re about the same age, David, I vaguely remember all manner of baked goods with the same crackly glaze on them. Looking forward to trying the recipe, but what I really, really want is that kitchen! This site may help your readers who struggle with different cooking measures and terms. It’s pretty comprehensive, although there is plenty of other information out there. I long to make this wonderful pie. Alas, I only eat desserts on special occassions. One small note: the Turkish pastry is spelled, “Yufka.” I remember my mom making it on long Sunday afternoons when I was a kid. What’s so interesting about this Parisian pastry is that it’s nearly identical to the “Apple Slices” my mother would make when I was a child in the 60s and 70s in the Midwest. It was much flatter, however, and made in a jelly roll pan– otherwise nearly the same. A winning combination, and I like the idea of the higher fruit ratio in this. 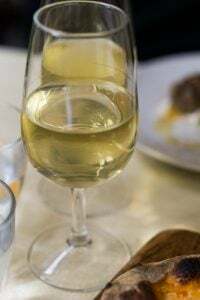 With a little booze in the glaze it tastes heavenly- hereabouts we use Kirsch or Williams. Give it a try! Nancy and Mimi: That was corrected. If it’s not showing up, trying refreshing the page or your browser. Will: Yes – and some of them had those red glacéed cherries! Thank you so much for the recipe. I can’t wait to make this. It reminds me of apple slices – but much more sophisticated – yum. Golden delicious apples taste great if they are fresh and crisp. If they are woolly and of poor taste they have probably been in cold storage for too long and won’t make a tasty pie either. If I remember correctly, didn’t he have TV series years ago? A pie with frosting!!! Life doesn’t get much better than that. I have Nick Malgieri’s A BAKER’S TOUR and I go to it often. Have all his cookbooks. Have never had a failure using one of his recipes. But he became my hero when he said you can omit the melted butter from a genoise. Hi David. Thoroughly enjoy your blog. It is the highlight of my inbox. I will be baking this pie over the weekend. I am going to search for Nicks books now. I had never heard of him until now but I am really excited. Thanks for sharing. Did I read this right? You went all the way to New York to see Nick making this pie? And then you came back with the pie? I so want to be you! Thank you for the recipe. Could you please explain why the pie should be placed on the lowest rack of the oven? I always place whatever I bake on the middle rack. Recipe is looks so simple and doable. Can’t wait to try this!!! I adore you, David and will get right to this lovely pie. thank you! I haven’t seen a pie with icing before! I suspect I would like pie a whole lot more if they all came with icing! Looks great but in the dough instructions, you don’t mention when to add the sugar. I’m assuming it is pulsed with the flour and other dry ingredients, but thought I would check to be sure. I took a Christmas Cookie class with Nick back in the 90’s. I still have and use those recipes. He was a great teacher! When I was a kid the Hostess company made little individual pies that were frosted. Apple, berry, lemon, pineapple, cherry. Delicious! This reminds me of them, though I know this one would be immensely more delectable. It looks intriguing, but is is a pie or a torte? The cake pan, the baking powder and the icing lean me towards a torte. I am sure it is delicious, but what is it? I made this (ostensibly to celebrate pi day!). It looks like a torte but ate like a pie. It was delicious and beautiful, if I say so myself. Definitely going in the “make again” list. Thanks for sharing this lovely recipe. Oh, and the icing? How fun is that? And yes, I added the sugar with the flour and the dough was perfect. This looks like such a delicious take on an American classic! I just made this wonderful pie for my annual pi(e) party. It was delicious and a big hit. The only adjustment I made was to roll the pastry out between two layers of cling wrap. This prevented it from sticking to my rolling pin. Can’t wait to make this for a summer picnic. Made the pie and ordered the book! I’m coming to Paris next week. Is there anything you would like from the grocery here in Nashville? Grits? Peanut butter? Moon Pies? I would be happy to bring you treats from home. And I’m hoping you will have a book signing event while I’m there. I made this over the weekend and it turned out very well, except that I think the amount of apples is way off — 2.5 pounds left me with half of the filling left over. I think around 1 – 1.25 pounds should be about right. Glad you liked it but interesting you felt it was too many apples. Normally 2-3 apples make up a pound. But thanks for the feedback. I posted up above about having half the filling left over. At lunchtime today, I walked over to the supermarket where I bought the apples. Their scales have two sets of gradations on them — pounds and kilograms. On the plus side, I have enough filling to make another one of these. Thanks Chris! I am making this tomorrow and was starting to wonder about too much filling. I suppose “French kisses” in France are just “kisses”. I mean, they do do that right? Hee! In reply to the comment above wondering about a gluten-free substitute: I use either Pamela’s All-Purpose Artisan Blend or Cup4Cup for pastry. Works like a charm. My only warning is that gluten-free pastry dough can turn tough more easily than dough with gluten and is harder to roll out. Try to work it as little as possible. Nick has a couple of gluten-free dough recipes in the book which might be worth trying for those who are gluten-free. I’ve not used any of those gluten-free flour blends, but if I baked frequently and was gluten-free, I would check out his book at your local bookseller and see if the gluten-free recipes in the book might suit your needs, rather than paying for gluten-free flour substitutes, which are about $5/pound. You can also make your own gluten-free flour blend, from Shauna’s recipe at Gluten-free Girl. Hi David. I have been reading your wonderful blog for years and have never posted. This recipe inspired me to try pastry again…No matter which recipe I follow my pastry is ALWAYS too crumbly and damp!. My attempt here had similar results (I am sure it is me and not the recipe!!) What am I doing wrong!!! (Anyone….please help!) I’m guessing the pastry was too warm? 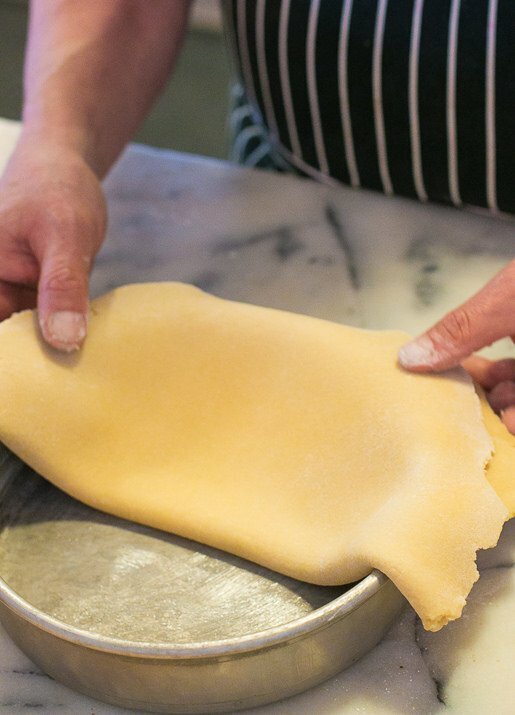 Hi Lorraine: It’s hard to assess if your pastry doughs are always both crumbly, and damp. Because crumbly implies that the dough is too dry and I would say to add more water or liquid, such as egg yolk. But if it’s too damp, am not sure what to say. You might want to try another brand of flour.